Small business (SMB) and remote or branch offices (ROBO) of larger organizations often rely on a small team of personnel to manage all IT services across all locations, including applications, servers, storage, security and data protection. Edge Office addresses these needs by collapsing compute, storage, networking and virtualization into a simple and affordable hyperconverged infrastructure solution that can be managed by a single IT generalist. Edge Office affords the SMB and ROBO customers the same infrastructure benefits and management simplicity that our enterprise customers benefit from. VMs deserve the maximum performance an HCI solution has to give, but with some solutions a VM can only access it’s local nodes resources. Pivot3 is different. Each Edge Office node contributes its cache, bandwidth and IOPS into a single pool of resources that is made available to all VMs, regardless of locality. As HCI nodes are added to a cluster, capacity and performance scale simultaneously, and storage efficiency can improve, up to 82%. At its core, the vSTAC operating environment is a powerful, yet efficient software-defined storage service that consumes less than 10% of system resources, leaving more available for VMs and applications. Additionally, Edge Office interoperates with external storage and servers in the datacenter, allowing businesses to leverage their existing IT investments. While some HCI solutions rely on high overhead replication for data protection, Pivot3’s patented Scalar Erasure Coding delivers the optimum balance of efficiency, protection, and performance businesses need. Edge Office can maintain application performance during degraded mode conditions, and can remain online even after up to three drive failures, or if a node and drive fail concurrently. Pivot3 converges compute, storage and VM management using VMware vCenter Server. Automate systems management with capabilities that include self-optimizing by event, self-healing, and self-monitoring which increases user productivity. Edge Office provides small businesses and remote or branch offices the same infrastructure benefits and management simplicity that our enterprise customers benefit from. 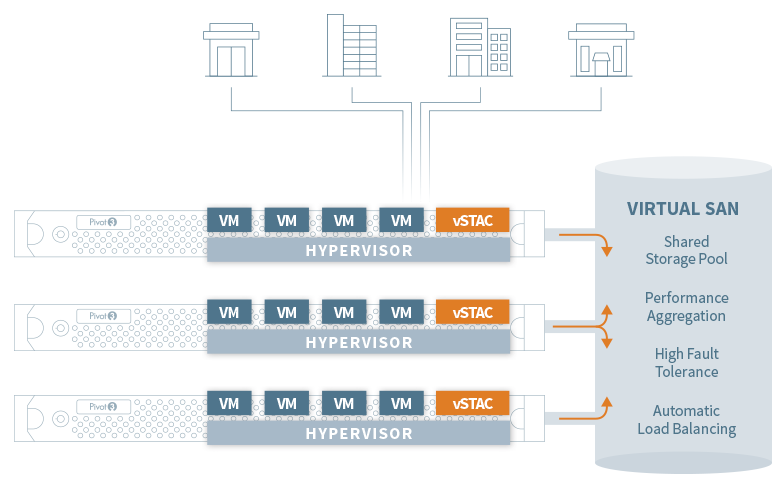 At its core, the vSTAC operating environment is a powerful, yet efficient software-defined storage service that consumes less than 10% of system resources, leaving more available for VMs and applications. Additionally, Edge Office interoperates with external storage and servers in the data center, allowing businesses to leverage their existing IT investments. Pivot3 converges compute, storage and VM management using VMware vCenter Server. Automate systems management with capabilities that include self-optimizing by event, self-healing, and self-monitoring which increases user productivity. Intuitive and easy-to-use, a single IT generalist can efficiently manage all IT services across locations. Edge Office provides small businesses and remote or branch offices with a simple and affordable HCI solution that can be managed by a single IT generalist.